The Journal of Tropical Medicine and Parasitology is published biannually by the Parasitology and Tropical Medicine Association of Thailand. The Journal aims to disseminate recent research in tropical medicine and parasitology. Original research articles, short reports, research notes and review articles may be submitted in English or Thai (with English abstract). Manuscripts judged to be of potential interest to our readers are sent for formal review (peer review) by a panel of experts selected by the Editor. All submissions are assumed to be exclusive to the journal and become Journal copyright on acceptance for publication. Manuscripts should be typed, double spaced on single-sided standard A4 paper (21.2 x 29.7 cm). All margins must be at least 2.5 cm. Metric measurements should be used throughout the text and illustrative materials. Generic names should be used for all drugs; include the proprietary name if it is more commonly known. Instruments may be referred to by proprietary name with the name of the manufacturers in parentheses. When reporting experiments on human subjects, the author should indicate whether the procedures were received ethical clearance by the appropriate authority. Original articles should include an abstract, introduction, materials and methods, results, discussion, acknowledgements, and references. Tables, photographs, graphs and figures should be clearly numbered and submitted separately from the text. 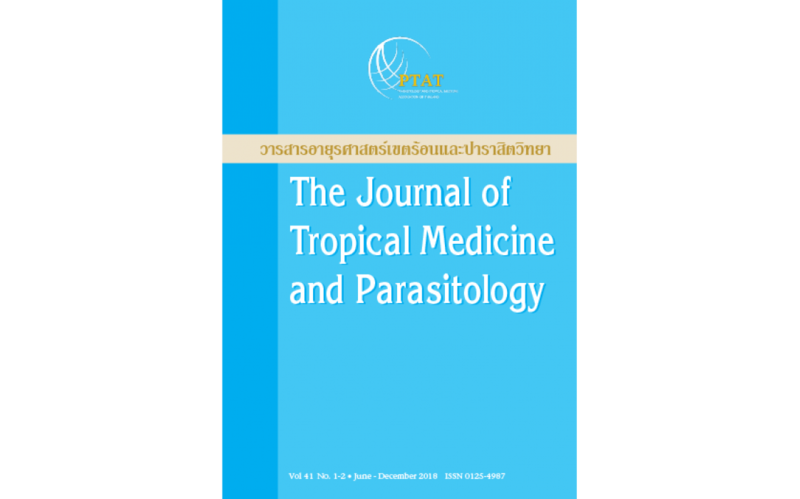 Authors should submit two original copies (including tables and figures) of their manuscript along with a copy on CD/DVD (Microsoft Word) to the Managing Editor, The Journal of Tropical Medicine and Parasitology, Department of Helminthology, Faculty of Tropical Medicine, Mahidol University, 420/6 Ratchawithi Road, Bangkok 10400, Thailand. Title: The title should be short, specific and clear. The title page should be typed on a separate sheet and include the full names and academic affiliations of all authors, and also the name and address of the corresponding author. Abstract: The abstract is limited to 250 words and should include background information, objective, methods, results and conclusion. Key words should be listed below the abstract and should not exceed six words. Figures: Figures should not be larger than a standard A4 page and should be in the forms of original drawing, high quality photographic prints, or laser prints. Figures should be numbered in the sequence in which they are cited in the text. Figure legends should be typed double-spaced on separate sheets. References: References should conform to the ICMJE style and be numbered in the order in which they are cited in the text of the manuscript. Arabic numerals should be placed in square brackets in the text to refer to references. 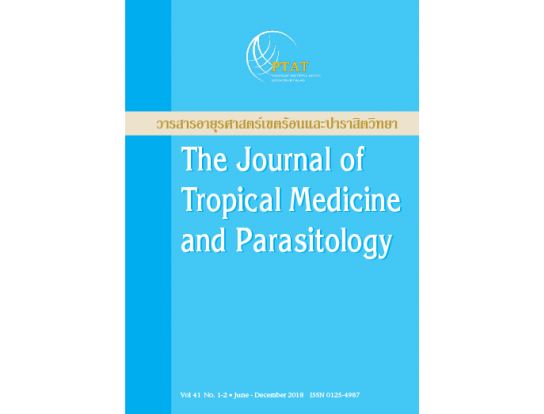 The examples below demonstrate the form required by The Journal of Tropical Medicine and Parasitology. List all authors unless there are more than six, then only the first six are listed followed by et al. Titles of articles from journals should be listed in full and begin with a capital letter. Names of journals should be abbreviated (in accordance with Index Medicus) without the use of periods and followed by the year, volume, number and the first and last page numbers. More than one paper from the same author in the same year should be identified by the letters a, b, c, etc. after the year of publication. Halpern SD, Ubel PA, Caplan AL. Solidorgan transplantation in HIV-infected patients. N Engl J Med. 2002;347:284-7. Diabetes Prevention Program Research Group. Hypertension, insulin, and proinsulin in participants with impaired glucose tolerance. Hypertension. 2002;40:679-86. Cook GC. Manson’s tropical diseases. 20th ed. London: WB Saunders; 1996. Gilstrap LC 3rd, Cunningham FG, Van Dorsten JP, editors. Operative obstetrics. 2nd ed. New York: McGraw-Hill; 2002.